Diwaterstofmonoxide is not a dangerous substance, but another name for h2o or water. In the near future this web page will give information on how drinking water is made. You can make drinking water with the use of groundwater. The ground water is pumped from the ground from a water well. 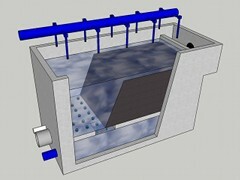 Cascade aeration is a method to exchange unwanted dissolved gases in the ground water for oxygen. 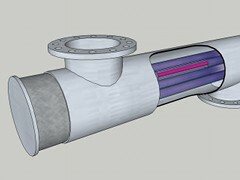 The rapid 'dry' sand filter is a container with sand. The filter removes iron, manganese and ammonia from the water. 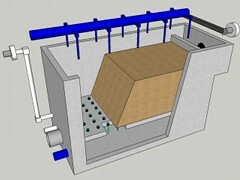 The rapid 'wet' sand filter is a container with sand. The filter removes iron, manganese and ammonia from the water. With a softening-reactor it is possible to remove calcium from water. This installation is used to make "soft" water. The depositing of the calcium op the sand in the pellet-reactor is not 100%. A small part of the calcium will be suspended in the water. The carry-over filter will remove these particles from the water. The active carbon filters remove almost all rest products from the water and improve the smell, colour and taste of the water. The UV-light (Ultra-Violet) wiil kill or sterilize bacteria, viruses etc.